The FBI-confirmed surge in U.S. mass shootings—up from an average of 6.4 incidents annually (2000-2006) to 16.4/year (2007-2013)—and other acts of domestic terrorism have public safety officials upping their game in terms of incident response, real-time surveillance, and victim rescue. In Salt Lake City (Utah), this enhanced approach response is embodied in the new Salt Lake City Public Safety Building (PSB). 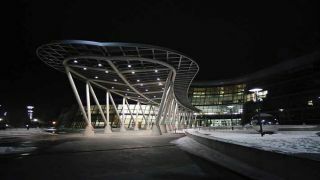 Opened in July 2013 and now in full service, the four-storey PSB is home to Salt Lake City’s police, fire, and EMS departments; plus all three departments’ integrated 911 dispatch center. Built for $125 million, the 335,000 square-foot PSB (including 172,000 square feet of occupied space and 143,000 square feet of basement parking) has been specifically designed to respect the lessons of 9/11, while having a minimal impact on the environment. These twin goals have been achieved by building a comprehensive level of resiliency into the PSB’s infrastructure, while the building falls within net-zero-energy performance and LEED Platinum certification building standards. This means that the amount of power the PSB extracts the environment is covered by the energy it generates through its 380-kilowatt rooftop solar panels and nearby one megawatt solar farm, plus the power saved through its energy-efficient design. From an AV standpoint, the Salt Lake City PSB represents a state-of-the-art, integrated approach to incident management. The heart of the facility is the PSB’s two-story Salt Lake Information Center Emergency Operations Center, which is built around a massive Christie MicroTile video display wall that dominates the room. The EOC is supplemented by the Incident Command Room with its two large-screen projection systems, and more. From an audio-video standpoint, the Salt Lake City PSB represents a state-of-the-art, integrated approach to incident management. The heart of the facility is the PSB’s two-story Salt Lake Information Center Emergency Operations Center, which is built around a massive Christie MicroTile video display wall that dominates the room. The EOC is supplemented by the Incident Command Room with its two large-screen projection systems, and the Media Briefing room with its 3-by-3 video wall. The guiding strategy behind idea of the Salt Lake City PSB is for the city’s public response agencies to know what is going on, to respond to developing situations quickly, and to monitor how these responses are unfolding in real time. As well, the advent of camera-wearing first responders, 4G/LTE cellular telephone networks, and multimedia data/ voice communications means that the PSB’s SLIC/EOC team can be fully connected to what is going on, and deal with it accordingly. The Operations Center is the nerve center of the entire complex. This is why it is equipped with a 77 unit Christie MicroTile video wall, a Crestron DM-MD64x64-RPS64 x 64 HDBT matrix switcher (all AV systems within the PSB are controlled using Crestron Fusion asset management software), and a sophisticated multi-window processor. “The display wall is used to display high resolution content originating from operator consoles, city cameras, television broadcasters, and other similar sources,” said Nelson. “They can display up to 20 different images/video feeds at a time.” The room’s AV system is controlled using Crestron TPMC-9 desktop and wall-mounted touch panels. Video is also central to the Incident Command Room, which uses two Christie digital projectors to fill up its massive screens, and the Media Briefing Room. Unlike the Incident Command room, the Media Briefing Room relies on a 3-by-3 video wall made up of Sharp 55-inch monitors. “The 3-by-3 video wall and professional speaker system is used to efficiently disseminate video and audio subject matter,” said Nelson. “With studio lighting and direct feeds to media trucks, information is immediately shared with the public.” Spectrum Engineering opted not to use projection TVs in this room, for fear that the TV crews’ bright lights would wash out the displays. Serving all these displays with HDTV signals proved to be a head-scratcher for Spectrum Engineers. Not all of the displays have the ability to decode all of the major HDTV audio formats being served through the PSB’s RF distribution plant. Without some form of technical solution, some of the displays would not be able to play the audio being sent to them. To address this challenge, Spectrum Engineers specified eighteen Contemporary Research 232-ATSC+1 HD tuners in various AV systems throughout the building. “The Contemporary Research 232-ATSC+1 HD tuner is able to decode digital audio in the audio format required for RF TV distribution on this project where tuners from other major manufacturers could not,” said Nelson. When the terrorist attacks occurred in Manhattan, one of the casualties of the World Trade Center attack was the New York City EOC located in World Trade Center building #7, which eventually collapsed. The loss of that facility resulted in a mad scramble for a new EOC, one that was eventually set up in a warehouse at Pier 92. Meanwhile, backups are the rule of the day at this complex. The PSB is equipped with two 1.56 megawatt diesel generators able to power the entire building. At the same time, the facility is equipped with an energy management system that will shut down non-critical areas automatically, conserving diesel fuel to maximize the PSB’s off-grind operational life.